Hello Ecwid Community! There are more than 1.5 million registered Ecwid stores around the world and this number is growing rapidly! Each one of that 1.5 million is unique and they all have their own specific requirements. To bring great tools and complementary services to all Ecwid merchants, we’ve developed the Ecwid App Market, available for merchants right inside the Ecwid Control Panel on the App Market page. We are featuring one interesting app every month that brings clear value to your business and brand. We will discuss some specifics of the app, how it can benefit your business, and how to install the app on your store. So let’s get started! This month we’re taking a look at Business Insighter which allows you to quickly and easily get a terrific overview of your Ecwid sales. The app is designed as an intuitive dashboard, and its many features are all on one page. Order status breakdown: How many transactions were shipped, returned, etc. Quick load time for regular amount of data. This app is great for any business looking to quickly get insight into its sales and orders. The dashboard is easy to use, intuitive and, well, very insightful (no pun intended). Rather than continue to ramble on about what this app does to help you grow your business, the Business Insighter team has put together this great video for you! Check it out! Why should I use this instead of free options? Any unfulfilled or denied payments, letting you reach out directly and be sure to make the sale. As always, it’s all right inside one easy-to-use dashboard so you can focus on growing your business, not fiddling with difficult analytics engines. How do I install the Business Insighter app? Go to the Business Insighter app page in your control panel and, as long as you’re using Venture plan or higher, click Get App and you’re ready to go! 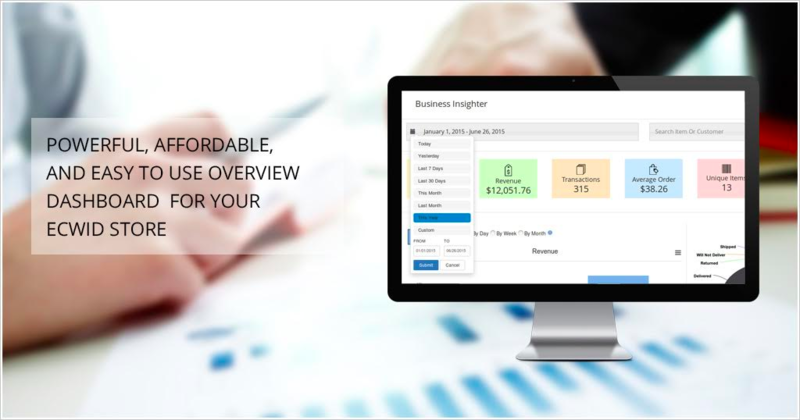 The Business Insighter app is available for the low flat fee of $9.95 per month, no matter how big your store’s sales volume. Start your 7 Day Free Trial today. All Ecwid apps are created by talented developers using the Ecwid API. This great tool allows these developers to extend, customize and build on the Ecwid platform to create amazing apps that act as a native part of the platform and making it a smooth experience for merchants. Are you a developer? Build an app!